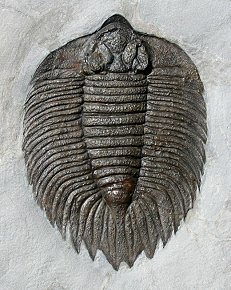 This is a very detailed example of a classic U.S. trilobite. It is a textbook Arctinurus boltoni from the Silurian of New York. 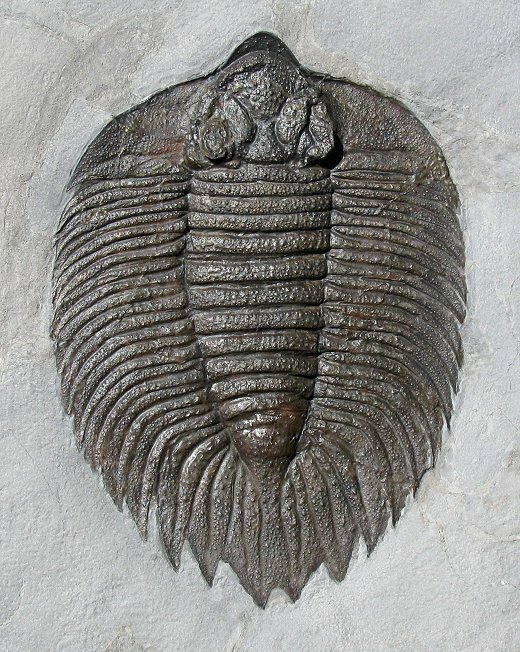 This is one of the most sought-after and displayable types of trilobites in the world. We collected the quarry for a year, and only found a handful of complete specimens. This fabulous trilobite was acquired from the elite collection of late Eugene Thomas - one of the most respected trilobite collectors in the world. This wonderfully articulated trilobite exhibits very fine detail - the entire carapace of the trilobite is covered with distinct pustules. The trilobite is quite inflated, and the cephalic process (''snout'') is easily seen. The pleural spines terminate in sharp points, and the broad, fan-shaped pygidium is beautifully displayed. The bug has great color and contrast and is nicely showcased on the large, rounded plate. This is a top quality example of this highly collectible, classic Lichid trilobite direct from the Eugene Thomas Collection.